Welcome to the weekend already!! Most of us just slid on in, but I did notice a few of you had your heels dug in and sparks were flying out the back. It's a shame it didn't work and now you've ruined those shoes! I've got another twofer for you today. Not a Twofer Card Challenge twofer, just two cards. I had planned to have a threefer for you, but a certain little varmint went to sleep on top of his wheel, fell off into his water bowl, which splashed water all over the card I was working on. That could be a good thing, but the water bowl itself tipped on its side and crashed into an open bottle of black ink refill. Not a good thing. My onefer today is an unconventional Valentine! Can Valentines be blue and green? Well, why not? The pretty stained-glassish panel was made with Brushos and cling wrap. I love this technique! If you want to try it, you can find several videos on Loll's CAS Mix Up Challenge site. The cool NBUS heart die is one of three "Highlight Frames" from Simon Says Stamp. The sediment is from "Oh Happy Day" by Avery Elle. CAS Mix Up Challenge: Cling wrap, stamping, Brushos, and die-cutting. CAS on Friday: Love/Valentine's Day. Calling All Sistahs: Clean and Simple. Stamping Sensations: Cold and frosty colours. Simon Says Stamp Monday Challenge: Birds of a feather. As always, thank you for coming by to visit the Playhouse! I'm having my second cataract surgery this coming Tuesday. Thank you for your patience with me as I neglect your blogs because I'm not able to spend as much time on the computer. Mwah! Beautiful cards, Darnell. I really like the first one with the Brushos and cling wrap. Such a lovely effect in blues/greens. I think as a cardmaker you can take creative license on Valentine colors. Not everyone enjoys red and pink! Your second card is lovely with the embossing and the sweet sparkly little bird colored and winked wonderfully. Hope Hammy is okay after his escapade and your second cataract procedure goes well. Hugs! So simple and so beautiful! I think CAS cards are the most difficult to make! Your Brusho and cling wrap creation is amazing! I really want to try that. It makes for a beautiful valentine. That minty background looks like tufted upholstery and is a gorgeous backdrop for you wonderful bird! I hope you are resting those peepers! Fab cards Darnell. Love the twinklie birdie! Oops! Back again - forgot to say - thanks for linking in with us at Stamping Sensations for our cold and frosty colours challenge! Shockingly clumsy of Hammy, falling off his wheel! LOVe that unconventional valentine, Darnell - the panel is gorgeous and that die cut heart frame is the perfect embellishment! And then there's that fabulous font on the sentiment, love it! Hope Tuesday's surgery is a smashing success! Well for goodness sake lets just cut straight to the chase. Is Hammy Ok??????? Hugs Mrs A. ( aka Frantic of UK). Hi Darnell, Loving both cards. Really like the unconventional Valentines. Both cards are fabulous Darnell -- those blues and greens on your Valentine are fabulous and I am seriously loving that embossing folder. Glorious on both counts...loving the CAS Valentine and I think Blue/greens are appropriate any time of year...especially one that is unisex. Plus you used a, new to me technique, that I'll have to add to my list. And the second card has everthing I love on it. Texture, birds, sparkle...who could ask for anything more? Two gorgeous cards. I love the idea of an unconventional Valentine. That design really is great. And, love the bird one too. Such a nice shimmer on that birdie too! So that is a great one also. So sorry the other card got ruined but now and then things like that happen. Have a great weekend now. Two great cards! Love the unconventional Valentine...cool technique! That embossing folder you used for the second card is yummy! LOVE the 3-D effect! I love your Valentine, Dolly! The colors work beautifully and that little heart on the ribbon is adorable! The embossing on the second card is gorgeous! And the little bird is one of my favorites. Love that inspiration photo that's making my mouth water. Amazing Valentine CAS with Brushos and cling wrap, it's a technique that always intrigues me so much, but I have never tried. Love the colors!! The second card looks so yummy :) with that 3D embossing and the sweet colors!!! Cute bird too, and the bit of sparkle looks great! Oh, I am so inspired (no, not the inspiration photo for Inspired by All the Little Things - though hopefully I'll get around to that) but by your blue and green Valentine. I am going to make a blue and green Valentine!! 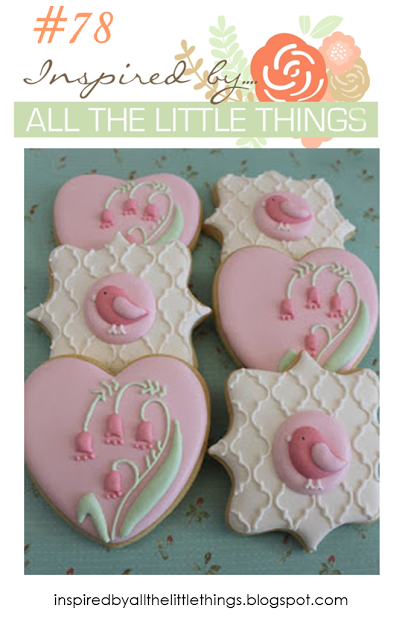 I also love your sweet little bird with his winkiness and pink bullrushes. Tell that naughty Hammy my puppy Tessa hopes he didn't get into trouble for all that spilling the way she did when she chewed up a galaxy background I worked long and hard on, and was thrilled with my end result - I guess she was thrilled too and her response was to give it a good chew. Forgot to say - thanks so much for joining us at CAS Mix Up with that fabulous cling wrap background! First card has a fabulous background and I love the Highlight frame, super CAS card. Your twofer card is a lovely shade of green and the background looks puffed up, like a bed head, super cute image and love the sparkle on the bird. Have a great week and remember time and tide wait for no man. Darnell, this is just too "tweet". And love that background in the soft green. So pretty and thanks for asking me to be your GD. I love both your pretty and sweet cards, Dolly. So pleased you added your 1st beautiful cling wrap card to our CAS Mix Up Challenge. Love the font on the Love You sentiment. The dry embossed background adds so much depth to your sweet bird image for your 2nd pretty card. TFS both and will be sending you quick recovery wishes for your 2nd surgery. Take care my friend. Hugs. Oh, Darnell !! The first card is absolutely stunning !! I love the colorful background, so beautifully emphasizes the belt with the heart. And your sentiment ... everything so perfectly matched. This card is perfect. I have those Highlight Frames dies, but have a heck of time using them. Thanks for the inspiration! Dry embossing is why I first gave in & got a Cuttlebug & oh my goodness--that is one gorgeous folder! Lovely cards, Darnell! Have a great week! Wow - love both the Brusho/plastic wrap technique and the 3D embossing folder. Both cards are awesome! Also what a pretty card your flower card is, that background is stunning. Valentines can be whatever you want it to be (after all we have the power), and your colour combo certainly makes me happy! I am in love with the colors on the Valentine - they look gorgeous and I'm sure lots of folks appreciate a break from the red valentine cards now and then! The embossing folder on the 2nd card is amazing and looks perfect with that great little image! Take good care of those peepers, and I wish you well with the upcoming procedure! 2 wonderful twofers today the first is such a brilliant colour and that technique looks amazing. Your second is so very super too love that gorgeous 3d embossing it treally stands out so wonderfully the design is awesome. Super colour as well and what a fantastic image. Wonderful cards, Darnell! I love both your beautiful take on the sketch and your super sweet take on the inspiration photo! The valentine is so pretty in the blue and green colors. I love the embossing folder on the bird card and the bird just shines. Both are so pretty. Poor Hammy, in trouble for just taking a nap! Gorgeous cards Darnell! Love the inspiration photo for IBATLT and your take on it. The embossed background is perfect and so is the coloring of the sweet little birdie. Sorry Hammy made such a mess for you but twofers are still a delight! What fabulous cards Darnell! Like the nontraditional colors and your background on the Valentine card, and your bird is just amazing on your second card! Both of your cards are lovely. 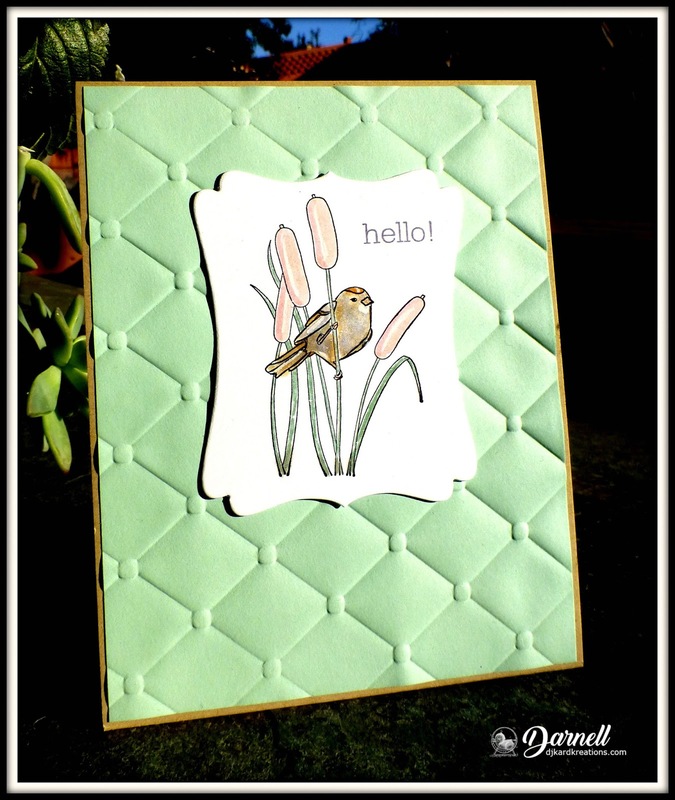 I love the embossed background and soft colors on the card for our weekly challenge. So pretty! Thanks for joining us on the Simon Says Stamp Monday Challenge. Unconventional colors for holiday cards are my favorite!! I LOVE the Brusho technique!!! That second card is a stunner. The close up of the bird with the sparkle-so pretty!! Glad you had some fun in the craft room!! I spent my day coloring and watching videos yesterday but no production. Sometimes that is just fun itself!! Beautiful cards Darnell, love the colors on the first one and the embossing on the second! Goodness, such gorgeous colors today! The stained glass panel is amazing and so wonderful for a CAS design. And I've always loved that Avery Elle sentiment font. Your embossing in the dreamy mint with the charming little bird is stunning! Best of luck on Tuesday! Two super cool cards. I love the sharp, crisp lines of the valentine card and of course the beautiful textured panel! Two fabulous cards Darnell, I love the gorgeous background that you've made on the top card and also the beautiful stamp on the second. Darnell youv;e done it again and absolutely aced these two cards - love them both, but i think the second one is my favourite of the two. I think you had better ban the varmint from the playhouse after that episode - maybe he had better come down under for some RnR as you must be working him too hard for him to be that fumble footed!! Love your stained glass in blues and greens. Hope Hammy is ok after being so clumsy.love your beautiful cards and your great dialogue on your blog. 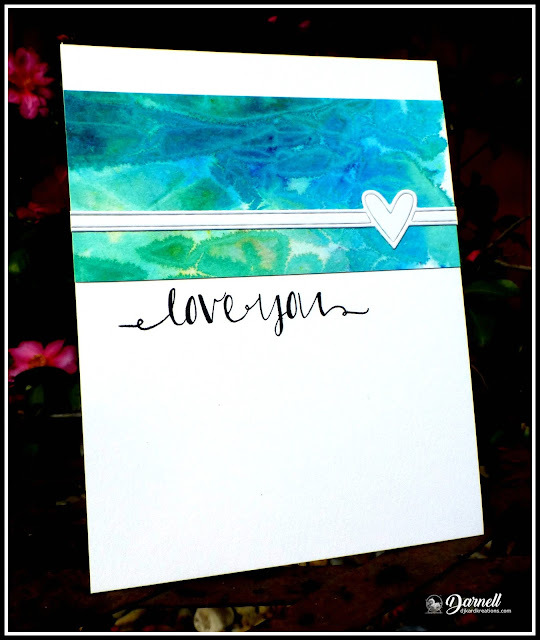 Blue and green Valentine is fabulous. I like the effect achieved with the cling wrap. Your twofer in "sugar" colours is amazing. The image is coloured wonderful. An unconventional Valentine to express unconditional love with unequivocal beauty! I'll take green and blue any day. The background is fantastic and I love the little heart strip and the sentiment script and all the CASness of it. Then there's that beautiful bird stamp. I love birds and can't get enough of them. So pretty with your winking and the pretty green embossed background. Two WOWs, Darnell! Your cards are beautiful, Darnell. That 3D embossing folder really packs a visual punch. Love the sparkly birds. Your unconventional colors are perfect as a valentine. Those brushos really are nice. Your Brusho panel is to die for, Darnell, and a very good color for a Valentine IMHO. That little bird in the cat tails is darling and I love the green quilted background. Absolutely adore your modern-looking Valentine's card! The blue/green color scheme is so refreshing amidst all the red, pink, and purple! And that sweet bird panel looks like it's sitting on a green comforter! What an awesome embossing folder! Two very pretty cards Darnell. I really like the blue and green for your valentine card. There are no rules. Your birdie is so,pretty with the 3D frosting. I am not creating a whole lot these days, a setback again and mojo on hiatus! Fabulous cards Darnell! I so love the EF you used on the pale green card - which looks good enough the lick by the way, get down Parsnip! I have a little white fluffy bundle scrabbling trying to reach the screen here! And as for sayings, I came across one in a SU stamp set the other day which tickled me - 'They say challenges make us stronger.......what a stupid system!'. Or words to that effect! Fab cards. As you can see I am way behind! working 5 days a week will do that. Love the brushos technique and the colours. Beautiful colour combo and the cling wrap really turned out clean. Such a dreamy valentine, perfect for the occasion. Perfect balance. Love your artsy Valentine, terrific colors! And that little bird looks cozy on the tufted background! I like the twist of more untraditional colors used for your Valentine's card. And the texture of the embossed panel in your second card, wow. And the sparkle! WoS looks lovely irl, not so easy to capture in a photo, but the detail image shows just how gorgeous it is. Both CAS cards are awesome Darnell! Love both of your cards! But that Valentine card is precious! I love the unconventional colors! 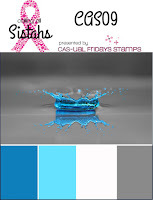 It looks amazing, thanks for sharing with us at the Calling All Sistahs Challenges!